Preheat oven to 375 degrees. Peel and cube the apples and put them in a medium sized bowl. Add the vanilla, nutmeg and cinnamon to the apples and mix them together. If you like your apples sweeter, you can add a dash of sugar, maybe a tbs or two. 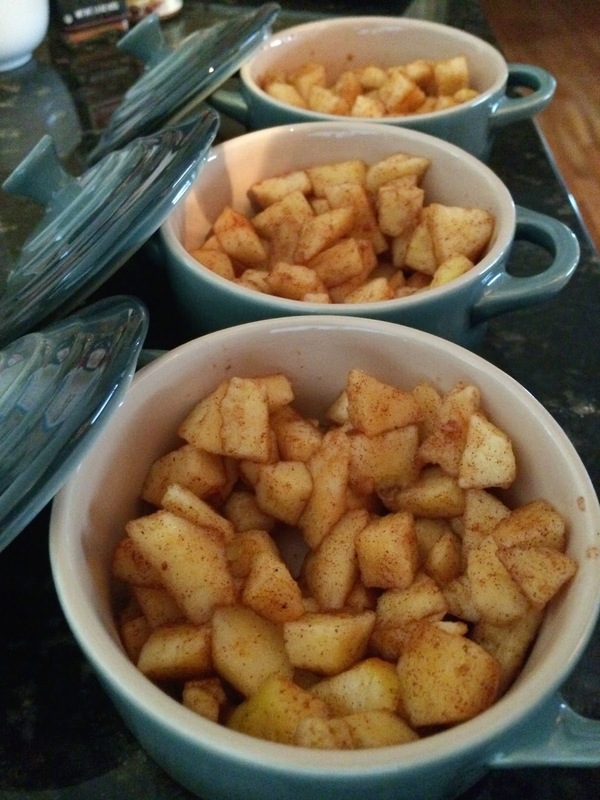 Add the apple mixture to the mini casserole dishes. Divide 1 tbs of butter into thirds and add it to the casserole dishes, I just stuck it in the middle of the apples and pushed it down. This will help the apples cook down. For the crust you need to crumble 1/2 a package of graham crackers. I did this by hand and used the back of my spoon to get those little hard pieces, but this is best done in a food processor. Melt 3 tbs of butter in the microwave, heating for around 15 sec at a time so it doesn't splatter everywhere. In the same mixing bowl used for the apples, add the graham cracker crumbs, the sugar and the butter and mix until the butter is well incorporated. Place the graham cracker mixture on top of the apples in the mini casserole dishes. Place the dishes in the oven on the middle rack with the lids on for about 15 minutes. After 15 minutes, take the tops off and let it bake for about 5 more minutes. Then turn the oven off and place the tops back on. Let the dessert stay warm in the oven until you are ready to serve.